By the time melted ice caps and rising sea levels wipe out 90 percent of human life, Donald Trump’s descendants will be among the elite who have shuttled off to Mars in tiny pods originally built by NASA. On Tuesday, Trump signed a bill allocating $19.5 billion to NASA for a crewed mission to Mars, deep space, and the investigation of Jupiter’s moon Europa. NASA hopes to send astronauts to Mars by 2030. In addition to sending humans to Mars, the bill urges NASA to find ways to “extend human presence, including potential human habitation on another celestial body and a thriving space economy in the 21st Century.” Other provisions in the bill require NASA to pay for spaceflight-related healthcare of retired astronauts, and ask that NASA work with US-based private space flight companies above foreign companies. 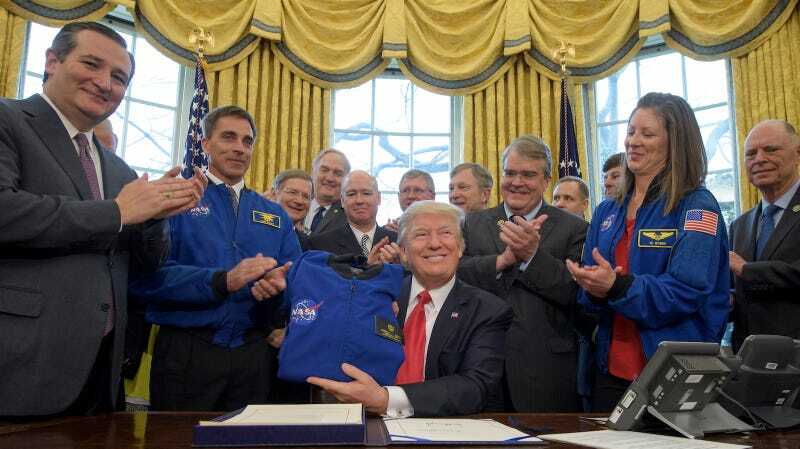 On the campaign trail, Trump boasted that he would “free NASA from the restriction of serving primarily as a logistics agency for low Earth orbit activity” and instead “refocus its mission on space exploration.” While the bill takes a small step towards fulfilling that promise, Trump’s larger vision does not value scientific advancement and research. Days ago, the administration proposed major budget cuts for the National Institutes of Health, the Department of Energy, the Environmental Protection Agency, and, within NASA, the elimination of its education program and cuts in climate change research. The bill cuts NASA’s Earth Science program by about $100 million.